Eggs have long been thought of as a diet no-no when it comes to heart health and keeping cholesterol in check. With an egg’s 185 mg of cholesterol making up almost two thirds of the total daily recommended limit of 300 mg, it makes sense that people watching their cholesterol are hesitant to consume this morning time favorite. pregnancy. Eggs are also one of the best sources of choline, a B-vitamin that promotes a baby’s growth and brain development along with helping to prevent neural tube defects. But how can a food so high in cholesterol not raise cholesterol levels? It turns out that dietary cholesterol- that which is found in foods we eat- does not actually have a large impact on our blood cholesterol levels. The liver and other cells in our bodies produce about 75% of our blood cholesterol which is important because cholesterol is an essential nutrient. It helps to make the outer coating of cells, as well as the bile acids that work to digest food in the intestine. It also allows the body to make Vitamin D and hormones, like estrogen in women and testosterone in men. Some people may not have high cholesterol because of the foods they eat, but may have a predisposition for the condition due to a gene mutation; or their bodies may make too much of it or not excrete it in their bile efficiently. In these cases, foods high in cholesterol should be more strictly limited as high blood cholesterol levels increase the buildup of plaque in arteries leading to heart disease. For others, it’s not foods high in only cholesterol that should be limited, but foods high in saturated and trans fat. It’s actually these fats that have been shown to have a greater impact on blood cholesterol levels than dietary cholesterol itself. Not only are eggs low in saturated fat with only 1.6 grams per large egg, they also contain beneficial antioxidants, two of which promote eye health. Lutein and zeaxanthin help prevent macular degeneration, and though eggs contain only a small amount of these antioxidants, research shows that egg’s lutein may be more absorbable than that from other food sources. Also, the high protein and low calorie content of eggs makes them a healthy, satisfying food topromote weight management. 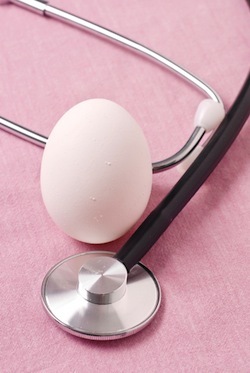 An egg a day can be included as part of a heart healthy diet while women with a history of high cholesterol or heart disease can safely consume 2-3 eggs per week. Not only are eggs a complete nutrition package, they are versatile and easy to prepare. In just a few minutes you can whip up a tasty egg scramble or omelet. Throw some spinach, tomatoes, broccoli and onions into the mix for added iron, vitamin C, fiber, and antioxidants. Don’t let egg’s cholesterol content prevent you from getting a healthy dose of important pregnancy nutrients- just remember, everything in moderation, even the incredible, edible egg!